You are here:Home » Blog » Byron Bay Holiday Guide » Are you ready for the Christmas holidays? We are! Are you ready for the Christmas holidays? We are! Here at Broken Head Holiday Park we are getting into the festive season early and reducing the minimum night stay. If you stay in the month of December in school holidays the minimum nights to pre-book is now 4 nights. Wow! For all those families that have a tight budget this is perfect for you. For the school holidays we have plenty of activities to keep the kids happy and BBQ days to feed the whole family. Just a short stroll to the beach and breathtaking lookouts, there is something for everyone. Don’t miss the Local Brunswick Twilight markets on 14th December they are the best around. With fun rides and cool stalls it is also a great place to buy Prezzies for friends and family. So get the friends and the family together for a fun holiday at Broken Head. 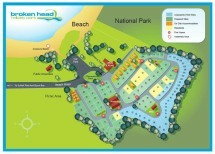 We still have plenty of sites and cabins left, so come have a very merry Christmas at Broken Head Holiday Park. So if you would like to have a holiday this Christmas without breaking the bank give us a call today. But hurry deals like these won’t last, so get in quick. Call our toll free number 1800 450 036 to make a reservation today.